Border Police officer recalls harrowing car ramming attack north of Jerusalem, in which lightning-fast reactions kept injuries to a minimum. Chief Inspector A. of the Border Police, who commanded the troops that took out the Arab terrorist in Thursday's car ramming attack near Adam Square in the Binyamin region of Samaria, reenacted the incident later in the evening. In the attack just north of Jerusalem one soldier was lightly wounded, while the 20-year-old Arab terrorist from Kalandiya in northern Jerusalem was shot dead after eventually ramming into a concrete block. 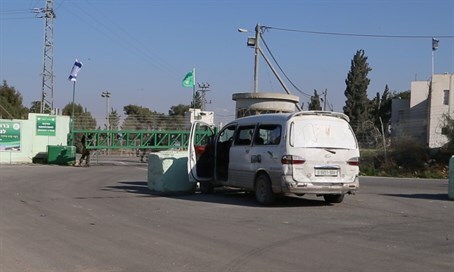 "Around 12 p.m. a group of Border Police fighters and officers together with IDF soldiers were present at the entrance to the Ramah Base adjacent to Adam Square, before they headed out for routine operational activities," said A. "As the forces went out from the site, the soldier stationed at the gate noticed a Hyundai car driving wildly towards the forces and shouted to the fighters so as to warn them." "We identified the car speeding towards us on the access road meant only for those entering the base, which left no doubt regarding the intentions of the attacker, and we immediately understood that this was a car attack," recalled the soldier. The Chief Inspector said, "the combat soldiers jumped for cover as we opened fire on the terrorist, until he was neutralized." "The quick response was the only reason that the incident ended with only light wounds," he emphasized.